Are you creative? Do you want to help raise money for homeless animals? Then get out your hammer and staple gun and get ready to have some fun! This snappy Red house was an entry from last year. See below for a few more photos from last year’s competition. Citizens For Animal Protection is announcing their 5th annual Dog House Competition (Knick Knack Paddy Whack Build A Dog A Home) to benefit their shelter at 11925 Katy Freeway. All entries are displayed at the Relaint World Series of Dog Shows, July 16-19 at Reliant Arena where the houses are auctioned to the public over the 4 day show (and sometimes make it on the Animal Planet show!). This contest is great fun and raises much needed dollars to support shelter animals. Past entries have included renditions of a Taj Mahal, outdoor cabins, maritime boats, city lofts and much more. (You could even take the easy way out and buy a house like this one from Calling All Dogs and donate it to the auction!). 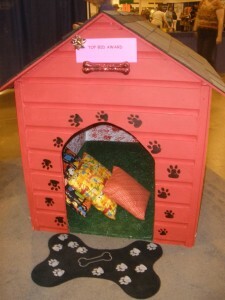 To enter, send an email to dogshowdoghouses@yahoo.com to receive the contest rules or call Trisha at 713.464.3525. Good Luck! yay i cant wait to do this !